When you switch to being a freelancer, the one thing that hits just about everyone is becoming overwhelmed with having to manage everything yourself. It’s not enough to just focus on your craft and deliver amazing results for your clients. You actually have to find those clients first! I thought I was ready, after all, I had managed multiple projects and cross-functional teams, with a million things up in the air all at once in my earlier jobs. How hard could it be? Soon I found myself struggling to keep up. I was mailing out 10-15 pitches per day (at the beginning), and pretty much lost track of them after a few days. As clients started coming in, I struggled to keep track of deliverables. I had hoped freelancing would be lower pressure and lower stress than my corporate job… it wasn’t. Now I was struggling to keep track ad-hoc requests from 4 different clients at a time. It was a nightmare. I was spending more time keeping track of pitches and clients than I was doing real work. Something had to change! I was spending more time keeping track of pitches and clients than I was doing real work. I tried setting up an elaborate system of filters and labels. That didn’t quite work. I used Excel with multiple sheets, filters etc. That didn’t work. I tried a few project management tools — I figured that after all, this is just project management. I experimented with some apps and programs that claimed to be perfect for tracking freelance or hourly work. They weren’t enough — they helped track existing work, but not in tracking new pitches. Plus, I hated copying email addresses and notes over from Gmail into these apps. Then I stumbled upon Streak. At the risk of sounding like I’m on their books, since finding Streak I’ve become a much calmer person. My inbox is no longer a mess. I know exactly how many leads and pitches I have in the pipeline, how many deliverables scheduled for this week, and what stage each project is at. I feel in control. It’s so much easier to find information about a client, a pitch, or my next article. But I’m getting ahead of myself. Let’s talk a bit more about Streak. 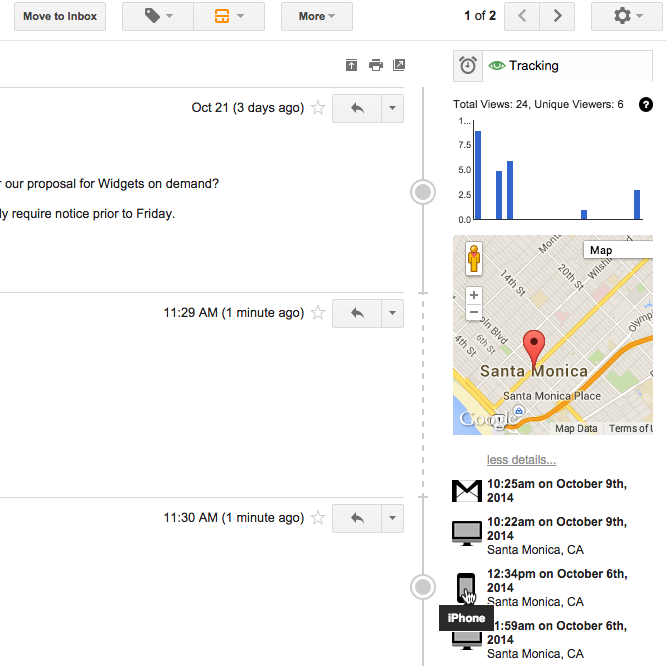 Streak calls itself a CRM tool that works inside Gmail. For freelancers especially, most of our work discussions and deals are managed via email. Copying that information into another tool to track and manage is a process no one can possibly enjoy. It adds to those pesky non-billable hours. Streak aims to let you manage it all, right from inside your Gmail inbox, with minimal overheads. For me, that’s a big win. So I set up a simple pipeline for this in Streak. When I get a new lead, I create a “Box” with the details I have so far for this Lead. I can set it up so that all further emails to and from this new lead will show up in this box. When I send out the first pitch to this lead, I just mark the box as “Pitched” and then keep following up on it, taking it through the different stages, until I close the lead. The colorful summary bar at the top gives me quick view of how many pitches I’ve sent, and where they stand. The best part is that the interface is very easy to learn. This example shows tracking for 10 Leads: 2 of them still haven’t got back to me after my first pitch, 1 is mulling over a sample I sent in, I’m negotiating the details with 2 other leads and I’ve won 1 new client. Also note the neat rightmost column for “Deal Size” – really helps keep track of which clients are more likely to yield better rewards. Once I’ve won a client and we’ve chalked up the project schedule, I move the box to my “Scheduled Projects” pipeline. I’ve started using a similar method to track my deliverables. I prefer this to Excel or any other project management tool because it ties in so well with Gmail. All the information, the mail threads and discussions are all in one place. For example, for my writing work, I’ve set up a simple pipeline that covers Pitch -> Research -> Draft -> Writing -> Editing -> Submission -> Publishing -> Billing. At each stage, it just takes me a click to move the box along. That one click has made it so much easier for me to keep track of my workload, schedules and billing. Again the colorful summary at the top lets me know how many article writing assignments I have in the pipeline, so that I can avoid over-scheduling. Snooze : The tool I probably use the most is the Snooze button (Yes, the same goes for my morning alarm!). Hitting the Snooze button is like setting a reminder when you want to follow up for feedback or reply to a mail later. Streak will automatically pop the mail to the top of your Inbox at the pre-set time. There’s also a nifty option — “Only if no one replies” — that helps you make sure leads don’t go cold. Snippets : The next most-used tool for me. If there’s an email you send often, or a few lines that you use often in your mail like links to your portfolio or client referrals, you can save them as ‘Snippets’ and set a shortcut for them. When you’re writing your email, just type out the shortcut and your snippet is pasted in. There’s also a snippet button conveniently located in the tool bar near ‘Send’. Email View Tracking : When you’ve been using Gmail and Outlook for a decade, this one feels a bit like magic. Right next to the email thread, on the right side bar, you can see how many of your recipients viewed your mail, and when. Though I haven’t used it much yet, it’s a great way to check whether those leads you’ve been mailing to actually opened your email. Or if you’d really like them to take you seriously (or spook them), keep a watch on that email tracker and call them as soon as they’ve read your mail. OK, definitely wait a little bit first. Mail Merges : This is handy if you need to send out an email to a large number of people, but also customize it for each individual. Perhaps you want to announce your new personal website, or that you were featured on Entrepreneur; the Mail Merge feature lets you create a mail template and customize it based on fields you’ve populated such as client name, introduction, etc. Streak sends it out as an individual email to each recipient rather than bundling them all into CC or BCC. These are just some of my favorite email tools with Streak, but there are more for you to explore yourself. Alright, I know I’ve gone on a bit about how great Streak is but it’s just the excitement of an unburdened freelancer shining through. If you think that what I’ve outline above could give you a helping hand then off you go, give it a shot. There’s a free plan to get you started so you’ve got nothing to lose. Get ready to say goodbye to freelancer stress! thanks for sharing the valuable information. It can do a great favour to people who are really busy managing their data. I am gonna try that too.